Reference number for this case: 2-Oct-54-Gouesnach. Thank you for including this reference number in any correspondence with me regarding this case. QUIMPER -. Five schoolkids of Gouesnach, a small community located at about fifteen Kms of Quimper, claim to have seen this latest Saturday in full after midday, two mysterious machines in the sky. Annick and Yves Le bris, Marc Gouesdec, Raymond Madec and J. C. Bellec, are all aged 7 to 8. The child who was the most precise is young Annick Le Bris, who stated: "the two objects appeared suddenly in the sky, one would have said two "bowls" upside down, with, between them, a long cigar. At some moments they moved and at some moment they remained still, only the "bowls" turned when the objects moved." The young girl also specified that when the machines moved, one did not see the median part having the shape of a cigar anymore. The children spoke to their parents only yesterday morning about what they had seen Saturday in the sky. All that is odd and disconcerting. None of the children (except one boy) had ever heard about flying saucers. They are besides too young to have paid attention. All the five were obviously impressed by what they saw. As for us, we were astonished by the precision by their observations. For example, at our request to draw what she saw, youg Annick Le Bris did not hesitate. Seizing her pencil box in her desk, she took out a pencil, and in a few moments, made a sketch to which her young brother made only one correction of detail. The newspaper reports on October 6, 1954, with no other information, that there was a sighting in "Gouesnach, near Quimper". The date is not given but the sighting is mentioned among others that took place on October 2 and 3, 1954. A schoolgirl of Gouesnac'h drew on the blackboard the machines which she saw in the sky. Everyone can think of the flying saucers what he wants. All the assumptions with regard to their exact nature are allowed for the moment and the most various testimonys abound on their subject. The first question is obviously to know if they exist or not. It should well be recognized that in the whole one remains skeptic although "honourable and worthy of faith" the witnesses who speak about it are. And yet this scepticism is sometimes shaken, so much are the descriptions which are given precise and concordant. We collected a really curious testimony yesterday, that of five schoolcildren of the public school of Gouesnac'h. The children all are aged from 7 to 8 years and belong to the class of Mr. Cornic, teacher in Gouesnac'h. It is about Annick and Yves Le Bris (children of the school principal), Jean-Claude Bellec, Raymond Nader and Marc Gouézec. The "apparition" is on Saturday October 2, about midday, but the children, although puzzled, did not speak about it immediately to their parents and it is yesterday morning only that young Annick, a very waked up and intelligent pupil, was to speak to her father about it while lunching. Mr. Le Bris, who had just read his newspaper, requested from his daughter many precise details that she provided him easily by the way. The other pupils, who played with the young girl, confirmed her remarks and recognized in a drawing that she made on the black board, the object that they had also seen in the sky. We ourselves questioned the children and we are astonished like the teachers, of the precise details which they provide. The five pupils left the canteen Saturday, where they had just finished their lunch, and had fun before returning in class. They were still alone in the playground, having been the first to finish lunching. It is at this point in time that they suddenly saw in the sky, coming from the direction of Pleuven (i.e. the south), two objects which astonished them. - we climbed on the wall of the court for better seeing, said young Annick. - it was, she told us, like two bowls "one against the other", bus separated by something longer, resembling a cigar. My brother believed initially that it was a helicopter, but there was no propeller. - Were these two craft moving? - Oh, yes. They seemed like wandering around the church, the school and the field. They did not fly very high. At moments, they remained stationary and only "one of the bowls" turned. Sometimes the bowls were not seen anymore, but only the cigar." This would explain in particular why certain witnesses claim to have seen saucers, and others the cigars. Because the five children are formal on this point on which we insisted: per moment, the children [sic] had void shapes, and by moment that of a cigar. - quicker than a plane, but they were not so high. - which color did they have? - dark gray. Somehow like aluminum. But it did not shine much. With regard to the noise, none of the children is able to define it exactly. - it was not like a motor, not like a plane, they say. It was not a whistle either. According to what we understood, it was a kind of "hush". - How did the two saucers disappear? - one zoomed away and the other caught up. Note: The GEPSI casefile above is obviously the reproduction of an article from the Press of that time; which references are unfortunately not indicated. 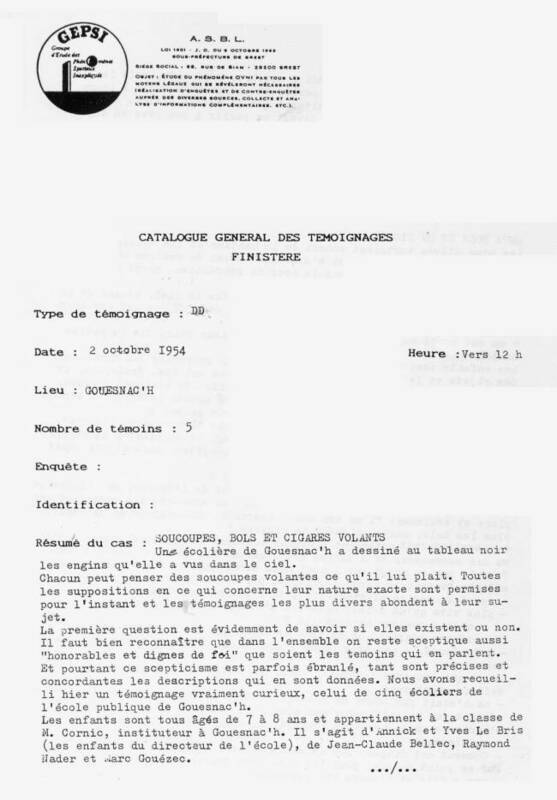 Luc Chastan indicates in his database that in the Finistère in Gouesnach on October 2, 1954 at an unknown hour, "Five schoolboys affirm to have seen in the sky in full afternoon, two mysterious craft." "They all are 7 to 8 years old. The most precise description is the following one: 'the two objects appeared suddenly in the sky, one would have said two bowls back to back, with, between them, a long cigar. At times they moved and ant times they remained motionless, only the bowls turned when the objects moved.'" "The witness also specified that when the craft moved, one did not see any more the median part having the shape of a cigar. Only one child had heard talks about flying saucers before the observation, but without paying attention to that. All the five were obviously impressed by what they saw." The source is indicated as being my website at "http://ufologie.net". 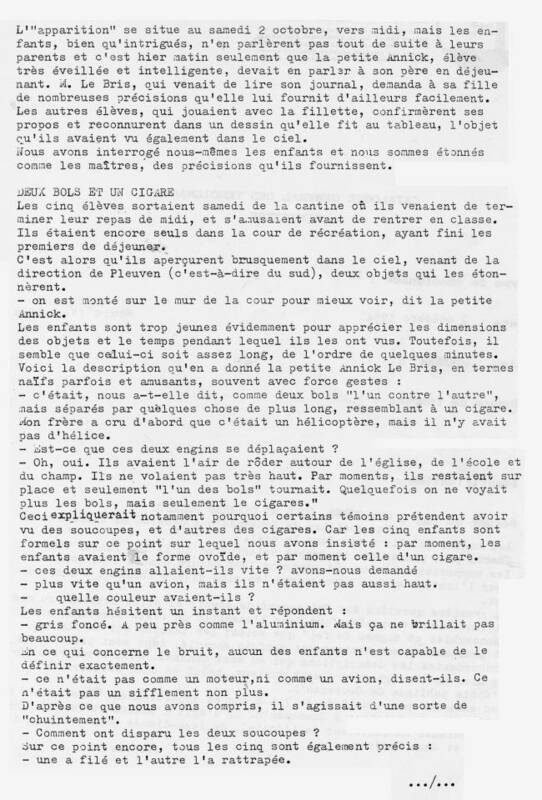 [lm1] Article in the regional newspaper La Liberté du Morbihan, France, page 9, October 5, 1954. 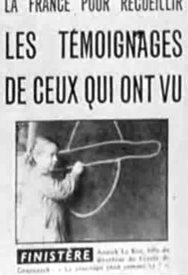 [fd1] Photograph in the national newspaper France-Dimanche, Paris, France, Octobre 1954. [ge1] File, GEPSI ufology group, France. 0.1 Patrick Gross December 2, 2005 First published. 1.0 Patrick Gross February 27, 2009 Conversion from HTML to XHTML Strict. First formal version. Addition [lc1]. 1.2 Patrick Gross June 28, 2010 Addition [fd1]. 1.3 Patrick Gross December 22, 2016 Addition [ub1].